Its so frighteningly common to hear a child as young as 5 or 6 stating they have failed, when really they have only just begun the learning process of growing into an adult. That word, failure, can halt the progress of an individual in its tracks, to a point where they can become unwilling to try anything new. I work with adults who, for some reason or other, have reached a point in their lives where they are unable to move forward in something they would like to do. So often when it is explored, we discover things which have happened in the past and stopped them then are stopping them now. My aim is to give children the opportunity to move forward with a 'can do' belief rather than an 'its hard one'. If you allow your child to continually express the phrase, 'Its hard,' they will believe that statement in the end. So, if they don't believe it when they are using it, why are they saying it? Its to get you to help them, to step in and make it easy for them. Whilst children, we only have very rudimentary knowledge of the value of a word. To a child, the word 'hard' means the opposite of 'easy' and that to them means someone does it for them in the way mum or dad has done everything for them up until now. If you think about it, as a very young child we tie their shoes laces, cut up their food, buy their treats, put them to bed, magic the washing clean and dry, we do everything for them and they luxuriate in a five star hotel with love and protection thrown in as a free-be; quite a nice existence. Then they get presented with something which lifts them out of this comfortable cocoon of wall-to-wall fun and we ask them to do something that is not generated from their fertile mind. Many respond by looking to the source of their luxury for them to take over and when we don't, they express the difficulty they are experiencing, that is, 'its hard'. If we have been conditioned well enough by our children we automatically step in and help them. They continue to express difficulty and we do more and more of it, until they have stepped back far enough so as to allow us to do it. I often see this because it is at this point where a large grin comes onto the childs face, very similar to the one you see when they suddenly understand something. Quick to learn, slow to reset. What have we taught them? We have taught them, if they say its hard, we will step in and do it for them. Question: When do you think this falls down and fails to reward them in the way they want? Answer: Its around the time when the, 'its hard' phrase, takes on a whole new meaning; I don't have the skills to know how to approach something that is hard [outside my current understanding] because until now, my mum or dad has done it for me. Can you see how the feeling of failure can grow? OK, so you've already fallen in the trap and they are saying its hard and you have to break them of the need to rely on you, because you know this is not a good strategy to rely upon, how do you move forward now? Firstly do not think you have failed, you've done something without being aware of how it can affect them later, so its not a failure its a temporary hiccup on the way. 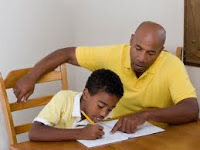 Another very quick way of learning is to mimic your parents and if they feel failure then the child will go out of its way to make sure it learns it too, sadly its a matter of instinct. Here are a few strategies to employ, I use them all in different situations and they work well. Comment: Its hard, I can't do it. Response: Is it, mm, so what is making it hard, which part of it is the problem? Response: I'm thinking we need to get to the bottom of this question and find out what it wants you to do.. Response: Can't do it or wont do it? What do you mean by that statement? Response:I know dear, but really, you can do it, just not yet because you haven't worked out how to do the question that's all. The responses above give you an idea of how to use language to push the problem back in their direction but at the same time be helpful to them in giving clues. Then you can use the plan of supporting them in working out the problem as shown in the article,"Whose homework is it anyway, part 2". What can we expect from a 10 year old?